Usually shown as a Germanic tribe, by the first century BC the Tulingi were a minor group that was occupying territory on the east bank of the Rhine, roughly between modern Heidelberg and Strasbourg in Germany. To their south were the Celtic Latobrigi, with whom they appear to have been allied, perhaps as protection against the far more powerful Marcomanni to the north. The tribe was possibly Germanic, but they may also have been Belgic, although which is true is entirely unclear. Perhaps they were a perfectly plausible mixture of both. That they appear to have been allied to the Latobrigi who also exhibit signs of being Belgic could be telling. Their name, Tulingi, breaks down into 'tul', a name, plus '-ing', meaning 'of' or belonging to the person, group or place before it, in this case 'Tul', and the Latin '-i' plural added on by the Romans. As for the meaning of 'tul', a guess has to be made that it is a shortened noun form of, perhaps, *tulguz (adj.) which produced the Gothic 'tulgus', meaning 'firm, steadfast', and Old English (adv.) 'tule', meaning 'strongly, firmly'. Julius Caesar stated that the Celts who lived nearest the Rhine waged continual war against the German tribes on the other side, although the Tulingi could be an exception to that rule. Charles Athanase Walckenaer, in his work in three volumes issued in 1839, with a new edition in 1862, considered it certain that the Tulingi were in the district of Thiengen and Stühlingen in Baden, and the Latobrigi were based around the Donaueschingen area, where the Briggach and the Bregge join the Danube. This opinion is founded on the resemblance of names, and on the fact that these two tribes must have been east of the Rhine. Bruyge, a small place on the Bregge, and of course the Bregge itself both seem to bear the tribe's name. The Encyclopaedia of European Peoples gives Schaffhausen in north-eastern Switzerland as their main home (fairly close to the Baden border). The Helvetii are coming under greater pressure from migrating Germanic tribes who have now arrived to their north and are occupying territory on the east bank of the Rhine. They plan to migrate into the lowlands to the west, but their proposed path will take them through the territory of the Aeduii, a Roman ally, and the tribes in the way fear that the Helvetii will plunder and destroy as they go. Orgetorix of the Helvetii dies before the planned exodus can go ahead, but the tribe decides to stick to those plans. Aquitania seems to be their target, where they hope to tie up with the Boii who have settled there, close to the Atlantic coast. Julius Caesar recruits two new legions to face the threat, but groups from several local tribes join the Helvetii, including the Latobrigi, Raurici, and Tulingi, making them one of the largest and most powerful forces in all of Gaul. They also unite themselves to the Boii who have crossed the Rhine to assault the Taurisci. As the Helvetii and their allies depart, they burn their villages and any food stocks that cannot be carried. The statement is clear - they do not intend to return. 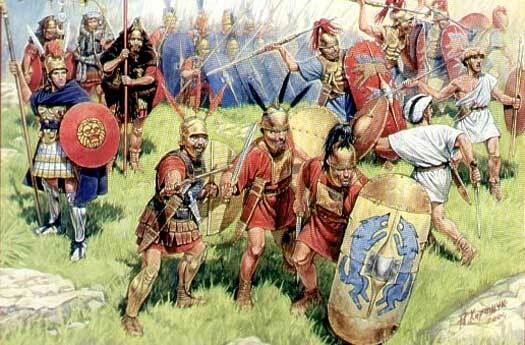 After some skirmishing, the Helvetii and the Romans face each other at the Battle of Bibracte in 58 BC, just outside the Aeduii oppidum of the same name. The Helvetii are mercilessly crushed by the six Roman legions. Perhaps two thirds of their number, men, women and children, are killed on the day, while another 20,000 are killed in the subsequent pursuit.